Silver coins are a very good investment and are not too expensive to buy compared to gold bullion coins. Silver bullion coins are easy to collect, inexpensive and expected to increase in value over the coming years as the world silver shortage continues. There are a variety of silver dollars available on the market. Also known as Collector Coins, rather then the actual Silver content in them, the value of a numismatic silver bullion coin is determined by several factors: its rarity, the number of coins originally minted, and the age and condition of the coin. Numismatic coins are bought and sold within the coin collecting community with little regard for today's spot silver price. Numismatic coins are cherished for their beauty, historical significance, and their potential investment value. Hence, numismatic coins sell at a significant premium over their intrinsic silver content. These coins contain precious metals that generally move up and down with the spot silver prices of the precious metals but also contain additional value above their precious metal content. Silver Bullion may come in bar or coin form. Its value is principally based upon its precious metal content plus the cost of fabrication. The value of a bullion bar or silver coin prices rises and falls with the spot price of the precious metal. 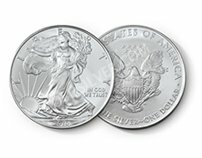 Most silver bullion coins, issued around the world, are denominated in troy ounces and are normally issued in 1-oz sizes. Usually silver bullion coins have 99.9% of pure silver. When buying silver bullion coins for an investment, these are the ones to purchase. First introduced in 1986, the American Eagle silver coin is is one of the freest trading and leading silver bullion coin choice among investors across the world. The American Silver Eagle is considered legal tender in the United States with a face value of $1 though the intrinsic value of its silver content is much higher. The Silver Eagle garners the highest bid prices for silver bullion in North America and is the most recognized and trusted silver investment vehicle on the market. The image of "Walking Liberty," located on the front of the silver American Eagle, first debuted in 1916 on the half-dollar coin designed by Adolph Weinman. Renowned for their beauty, Walking Liberty Half-Dollars are widely considered one of the United States' most attractive silver coins. The reverse (back), designed by John Mercanti, depicts a heraldic eagle with shield carrying an olive branch and arrows in its talons. An inverse pyramid of thirteen stars representing the thirteen original colonies floats above its head. The words "UNITED STATES OF AMERICA ' 1 OZ. FINE SILVER ~ ONE DOLLAR '" encircle the eagle. The Canadian Maple Leaf Silver Coin is one of the most recognizable coins in the world they are especially sought after in North America. This silver coin is the purest silver coin in the world with 99.99% percent fine silver purity. The Canadian Maple Leaf Silver Coin is considered legal tender in Canada with a face value of $5 Canadian dollars. 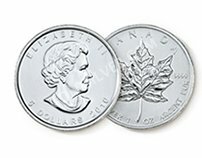 The Silver Maple Leaf Coin is backed by the Canadian government. The front, or "obverse," of the Silver Maple Leaf features a bust of Queen Elizabeth II. Originally, the bust depicted the Queen as a younger woman. The bust design changed in 1990 to feature a more mature portrait. The back, or "reverse," depicts a Maple Leaf, the national symbol of Canada for which the coin derives its name. The Silver Maple Leaf's reverse also lists the name of the country and the amount and purity of the silver - in both English and French, the national languages of Canada. Philharmonics were among the best selling silver bullion coins in the world. 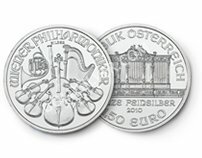 The Austrian Philharmonic Silver Coin can be used in legal contracts with a 1.5 Euro face value. 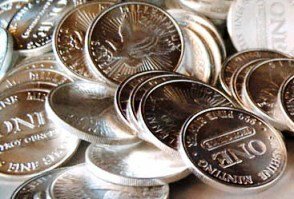 The Liberty Silver Round coin is recognized all over the world, which makes these silver rounds extremely liquid, easy to buy and sell. 1 Oz Silver Rounds have a low premium over spot compared to premiums on legal tender silver coins. 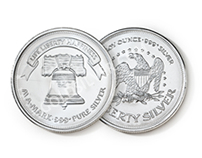 The Liberty silver rounds are so named because the famed Standing Liberty graces the obverse (front). The reverse of the Standing Liberty silver rounds carries a magnificent bald eagle, the USA's national bird. Rounds are not legal tender value. Partly for this reason, they typically sell for lower premiums than silver bullion coins issued by governments. OK, next question you probably want answered, what resource to buy silver bullion coins do you recommend? Return From "Silver Coins" to the Home Page "Stock Market For Beginners"